In the Ninth Chapter of the Bhagavad-gita Lord Krishna says: patram pushpam phalam toyam yo me bhaktya prayacchati/ tad aham bhakty-upahritam ashnami prayatatmanah. Here God is saying that He eats the offering of someone who has devotion. It’s an extraordinary thing. because God already owns everything. It’s not that God needs to eat. There was one great devotee during Lord Caitanya’s time—Raghunatha dasa—who used to live on just a little buttermilk every other day. He lived to be about one hundred and twenty years old. We sometimes even see yogis who are able to stop eating altogether. It’s actually a myth that we need food, because ultimately we’re spiritual. Someone thinks. “Unless I get a drink, I’ll die” or “Unless I have another cigarette. I won’t live until tomorrow morning.” Or even a cup of tea. Sometimes we say, “Oh. I’m dying for a cup of tea” or “I’m starving.” But, really, we’re not starving; we’re not going to die for want of these things. So, similarly, food is another thing we think we need because we think we’re this body. Of course, it’s not that we don’t need to eat—the body needs some food, we’re not saying it doesn’t—but if one comes to the point of liberation from the body, one can realize that one doesn’t actually need any food. It’s only the body that requires some food for it to grow. But once the body is grown up sufficiently, it’s actually possible to live on surprisingly little food. Many people have done it. Of course, it may seem a little strange my saying this, because in the Hare Krishna movement we sometimes tend to eat quite a lot, especially on festival days! But the principle is that a person in this world can actually come to the point where he doesn’t really need to eat. So w hat to speak of God—He doesn’t need to eat anything. In fact, the Lord is supremely independent. And yet He accepts our offering and He eats it. In a sense He does “need” it, because of the love. That’s the point: When there’s love, the offering becomes palatable. Anything becomes acceptable if there’s love. For instance, there’s a story about a beautiful girl who once offered her beloved husband a garland that had some mud on it. He took it anyway and put it around his neck, in spite of the mud. He accepted it because of her love. 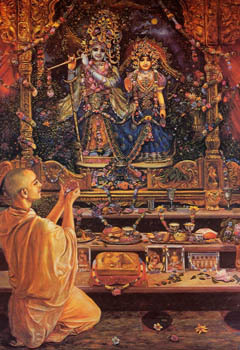 Krishna once made a surprise visit to the home of a devotee named Vidura. Vidura jumped up, sat Krishna down, and washed His feet. Next he tried to offer Krishna some bananas. But he was so bewildered by love that after peeling a banana he threw it away and gave Krishna the peel. And Krishna was so overwhelmed with love for His devotee that He accepted his offering. And it all begins by a simple thing—offering something. 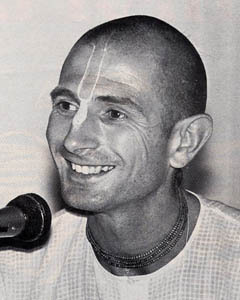 We can sing and offer our voices to Krishna, and we can offer other things. Krishna says, patram pushpam phalam toyam: “You can offer Me a leaf or a fruit or some water or a little juice—just something small—and I’ll accept it.” Everyone can pick a leaf from a tree or grow a leafy vegetable. Everyone can get a flower. They grow everywhere. You can offer a prize rose or a small wild flower—or even a dandelion or a buttercup! Everyone can get some water or a little juice. So it’s not the item that’s so important, but the love that goes into it. How much will you be overwhelmed with affection because she is reciprocating your love! You’ve got a bagful of sweets. You don’t eat sweets yourself. You certainly don’t need the sticky sweet your child is offering. But how could you not accept? It’s the most wonderful thing for parents when a child who is normally selfish, as most children are. becomes a little selfless and thinks of them. Similarly God is the father of everyone in the universe, and if somebody offers Him something. He immediately feels overwhelmed with affection. So this is the idea. We want to try to please God. It is said in the Vedic literature, yasmin tushte jagat tushtam: “If you please God, you don’t have to worry about pleasing anyone else.” If you pour water on the root of a tree, you don’t have to worry about the twigs, leaves, and branches. Similarly, if you want to do anything for anybody else in this world, do it for God, and then everything will work out perfectly. So we try to offer our devotion solely to God. If you serve God, you will awaken some love for Him. and you will naturally want to love and serve everyone else. We develop our love for God by accepting the things He likes and rejecting the things He dislikes. There’s a saying—“Love me, love my dog.” I might not even like dogs, but if I love you, then I’ll say. “What a nice dog you have.” If you love someone, then automatically you begin to love everything related to that person. You may take up a hobby that you didn’t have before. Your loved one likes to go jogging. so you find yourself going jogging, because naturally you want to do the things that your beloved does. Similarly, when we take up spiritual life and try to devote our lives to God. our interests change a little. We begin to think, “Well, what will please God?” We don’t give up our individuality, but we surrender it. There’s a difference. You may like to play hockey, but your beloved doesn’t like hockey. So you may decide not to play hockey anymore. You still have the ability, but out of love you change your life style. That’s the point. So Krishna consciousness takes some practice for our love to gradually awaken. For example, a child has an inherent ability to walk, but still he must practice. He first stands up by holding onto something. Then he takes the first step. Every child goes through the same procedure. And once the child can walk, his walking becomes spontaneous. He runs around everywhere without even thinking about it. It is the same with learning to drive a car. First you have to practice, and once you know how to drive, driving becomes second nature. Similarly, we have love for God within us—nitya-siddha krishna- prema—and when our consciousness becomes purified by hearing about Krishna, we develop a desire to serve Him. which becomes spontaneous after some time. It’s not that by cooking something for Krishna others are going to suffer. Actually everyone benefits—not only the people who eat the food, but even the food itself. It may sound extraordinary, but suppose you pick an apple from a tree and offer it to God—from His point of view, the tree has offered that apple. A tree is a living soul. just like you or me. It’s a spiritual person with a tree’s body. So when the apple is offered, it’s as if the soul in the tree is offering it. Krishna takes it like that. So the person in the tree’s body benefits. When the apple is offered to Krishna on the altar in the temple or in your home, it becomes transformed. It becomes spiritualized or “Krishna- ized.” If you take an iron bar and put it into a fire, it becomes “fire-ized”—red-hot. If you take it out of the fire, it will act just like fire. Similarly, an apple becomes spiritualized when it’s offered to Krishna . It may seem like an ordinary apple, but it has a greatly different effect on the person who eats it. When you take a poker out of a fire, it may seem like ordinary iron, but it acts differently when you touch something with it. So food that’s been offered to Krishna becomes spiritualized, and anyone who eats it will experience his consciousness becoming purified, spiritualized. Because God is spiritual and everything comes from Him. everything is really spiritual: it has simply become covered by a material curtain. By offering something back to God, the material curtain is removed, and the object’s real spiritual potential is revealed. Even tiny material things like atoms can release seemingly unlimited energy. From the study of quantum mechanics we learn that on the subatomic level so many amazing things go on that defy our ability to comprehend. So, though it is hard to understand, ultimately everything is spiritual. But when something is severed from God, it becomes material. In other words, it’s a question of consciousness. If I look at something in relationship to me, then I see it as material because I’m limited. Even spiritually I’m limited, what to speak of materially. The soul is infinitesimally small, or limited, whereas God is infinite, or unlimited. In fact, God is both infinite and infinitesimal. In the Vedic literature it is described that all living beings, whether in the forms of humans, trees, or bugs, are infinitesimal aspects of God. When the infinitesimal is linked up with the infinite, the infinitesimal has unlimited potential. But when the infinitesimal part of God separates from God, he is left to his limited devices. A spark in a fire shares the total heat of the fire, but if it falls out of thefire, it becomes an ember and dies. Potentially the spark can be put back in the fire at any time and glow again, but on its own it loses its glowing quality. Similarly a soul can become almost like a dead rock. In a tree’s body, for instance, the soul is in a sort of suspended animation, even though it possesses great potential spiritual energy. Krishna consciousness is a practical process of reviving our spirituality. It is said that “You are what you eat.” So if you eat spiritualized food that’s been offered to Krishna, gradually your body will also become spiritualized, and you will be better able to understand God. What to speak of understanding God, many people can’t even understand that they have a soul. For persons who are very materialistic—like those who constantly eat meat—it’s extremely difficult to understand the difference between matter and spirit. Anyone can say, “I love God” or “I know God.” but to actually understand God is another thing. One has to have spiritualized intelligence to understand spiritual subject matters. So eating food that’s been offered to God is a very important aspect of spiritual life.